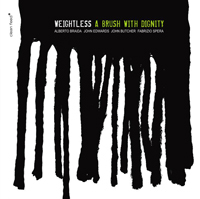 Atonal, audacious and admirable, Weightless is an irregularly constituted quartet made up of four top-flight improvisers: two from England and two from Italy. Recorded during two German gigs, the polyphonic expression is the result of the almost familial musical relationship between bassist John Edwards and saxophonist John Butcher on one side and pianist Alberto Braida and drummer Fabrizio Spera on the other. Over the past few decades Butcher has sonically matched wits with everyone from British guitarist Derek Bailey to French clarinetist Xavier Charles. Edwards, one of London improv’s go-to bassists, has played with personalities as different as British saxophonist Evan Parker and American drummer Sunny Murray, while Lodi-based Braida and Spera have separately or alone linked up with stylists such as Canadian bassist Lisle Ellis and German synth master Thomas Lehn. Although there are intimations of electricity here, no instrument is plugged into a socket. Instead the pulsating wave forms come from Braida’s internal piano string- exciting, Butcher’s multiphonics and overblowing plus the panoply of tones and textures the other two extract from their instruments. Furthermore, while perfectly balanced throughout, this group interaction doesn’t mean that any of the players sacrifice their individuality. Case in point: “Termo”. Inaugurated full force with sul tasto bass string bowing, snapping and rebounding drum pressure, reversible cascading piano chords and the saxophone emitting fierce bird-like cawing, antithetical roles evolve by the mid-section. While Butcher’s frenetic wide vibrato, spetrofluctuation and flutter tonguing work into an interlude of circular breathing that is both harsh and airy, Braida’s confined comping and near-meditative chording suggest unruffled continuity. Meanwhile Spera’s cymbal resonation and Edwards’ powerful thumps are tonal enough to keep the time measured. Nonetheless, tonality is also in the ear of the listener. Throughout, it’s not that others don’t accelerate to tension-laden, stop-time interpolations, or that the saxophonist limits his solos to smeared chirps, growls and tongue stops or echoes partial tone extensions. “Centri” for instance, which unrolls for more than 29½ minutes, demonstrates all sorts of improvisational strategies. The exposition works its way from bass string pings and drumstick squeaks on cymbal tops to a chromatic narrative that mixes aviary pitch variations from the reedist, snare ruffs, near legato bass string bowing and a dramatic two-handed, piano key-pumping that is as much prepared as poramento. Diffuse, wide-bore reed patterns exhibited with the caution tourists use to cross Italian streets, precede an extended pause where Jekyll-and-Hyde-like Butcher appears to split into two saxophonists: one playing straight-ahead and the other sounding buzzing split tones. As the two sides of his reed personality meld, the tune almost become a rondo, with Braida producing dynamic harmonies, Spera press rolls and pops, and Edwards picking and slapping his strings. By the time the saxophonist has progressed to guttural intensity and overblowing, the pianist’s staccato chording sounds as if he’s playing a pressurized version of “Chop Sticks”. A sudden cymbal smack unites this melody to the invention’s final section following a further protracted pause. As the saxophonist rolls unexpected phrases in his mouth as if savoring a sweet treat, the pianist strums and counters with dynamic note clusters. Hesitant nerve beats and ruffs from Spera underline Butcher’s irregular flattement and vibrated ghost notes as the others’ contribution to the final variant, collapses the theme into an overriding segmented buzz. Inventive and perfectly balanced whether legato or staccato, with solo tones or with layered timbres, the communication among the four isn’t weightless, but weighty is a good sense. Hopefully an encore CD is in the offing.